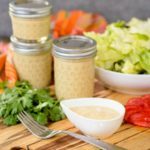 A recipe for homemade Chipotle Ranch Dressing. It is made with sour cream, mayonnaise, buttermilk, chipotle peppers, adobo sauce, and fresh herbs. Add more buttermilk, a little at a time, as needed/desired for a thinner consistency. This is a spicy-hot dressing. Use only 1 pepper and half of the adobo sauce if a milder heat level is preferred.